Loops de la Crème presents Magic Djembe, a djembe library for the full version of Kontakt 5.3+. Loops de la Crème present Boutique Drums, a new collection of samples directly recorded from Roland's new JU-06 and JX-03 Boutique synths. Loops de la Crème presents special weekend offers on its HiHat Essentials and Organic Transitions libraries. For a few days, Loops de la Crème's Booga Rocket Drums mono drumkit library for Kontakt is available at over half off. Loops de la Creme is having a flash sale on the Basic version of its Bell Empire Kontakt instrument. Loops de la Crème is about to release a new boomwhackers sample library and offers a donationware set of 32 samples as a foretaste. 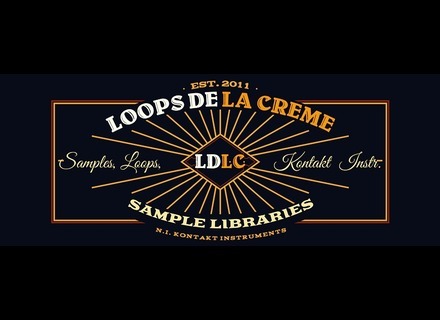 Loops de la Crème introduces a new sample library for Kontakt 5 featuring the sounds of 3 sets of chimes. Loops de la Crème has released the Deluxe version of its Bell Empire collection for Kontakt.